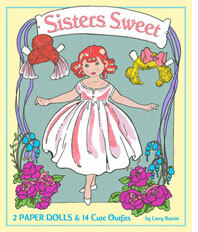 Sisters Sweet Paper Dolls is Larry Bassins first published book. But he has long been an established artist in the paper doll community and his colorful style is a favorite with collectors. His winsome paper dolls are reminiscent of childrens magazines and storybooks of the first half of the 20th century, with clean lines, bold colors and detailed backgrounds. He has created hundreds of one and two-page paper dolls of a variety of subjects. Perhaps the largest collection has been inspired by the classic comic book paper dolls such as Brenda Starr, Katy Keene and Mopsy Modes. Larrys artwork style perfectly captures the sweetness of childhood and his Sisters Sweet book of paper dolls is sure to capture the hearts of collectors.